The Woman (Israel) is pursued by the dragon for 1260 days. She flees to a place in the wilderness where she is taken care of for time times and half a time. 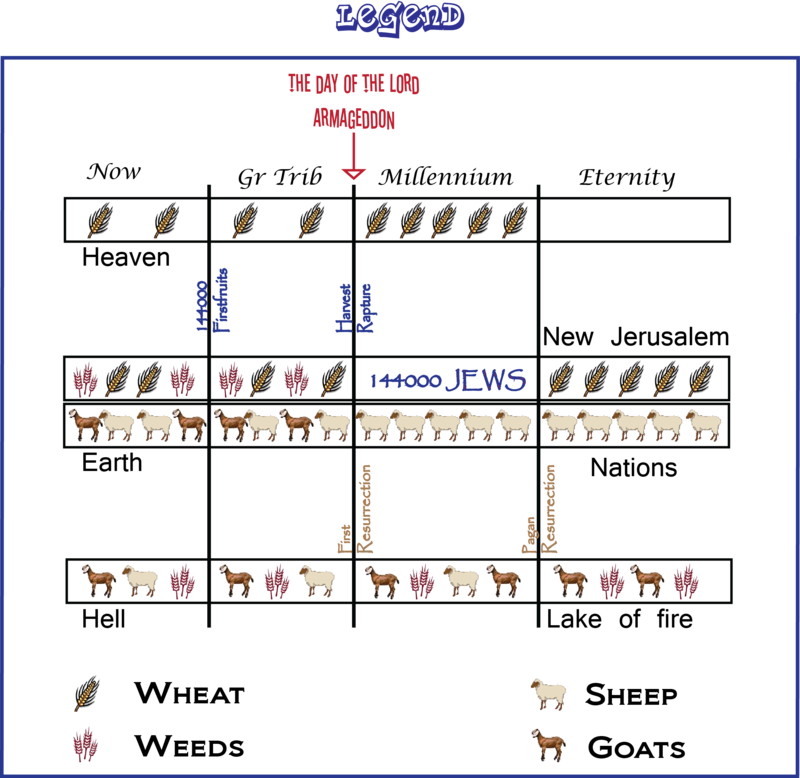 144000 Jews are sealed from the 12 tribes of Israel. The saints are given over to be persecuted by the beast for 42 months. The Beast will be given power to make war against the Saints and conquer them. When Christ comes at the last trumpet on the 1260 day of the great tribulation, the church will be raptured to be with Christ in the clouds. The first resurrection also takes place at this point. The Gentiles are non-believers (pagans) from the Nations who for the most part worship the beast and accept his mark. They will persecute the Saints and trample the Holy City for 42 months. Some will refuse the mark of the beast and help the Christians. Some Pagans (Gentile Nations) escape the Lake of Fire and are allowed to spend Eternity as the New Nations basking in the Light of the New Jerusalem. They are even given the Leaves of the Tree of Life for healing and they are allowed to enter the New Jerusalem once a year. It therefore follows that these nations must not have accepted the mark of the beast as they were not thrown into the Lake of Fire. It also follows that their Names must be in the Lamb’s Book of Life as they are allowed to enter the New Jerusalem once a year. When they are judged at the Great White Throne at the end of the Millennium, if their names are not in the Book of Life they are thrown into the Lake of Fire. The Harvest at the end of the Age. When Christ comes at the seventh trumpet before pouring out the bowls of God’s wrath upon the Nations. When Christ comes at the last trumpet, The true believers in the Church (Wheat) will go up to be with Christ and the people call themselves Christians but are not (Weeds) will go to Hell. 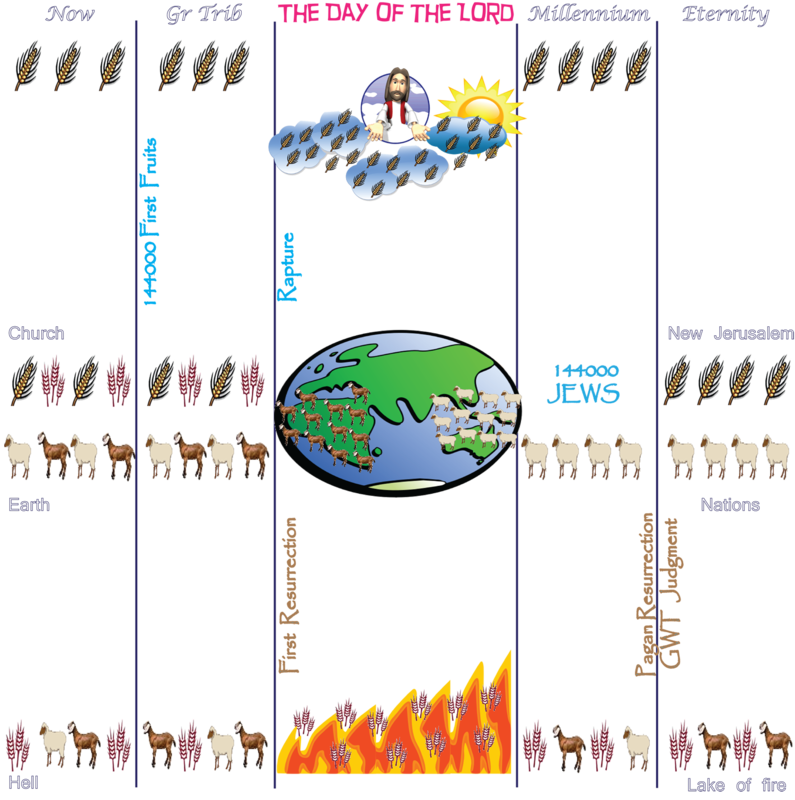 The rapture of the great multitude and the first resurrection occurs at the seventh (or last) trumpet. The last trumpet (the seventh trumpet) is when the Church is raptured 1Cor 15:52. It also signifies the end of this age and the beginning of the millennium. The second coming of Christ is at the seventh trumpet. Christ is coming to redeem / harvest the Church from the Earth and to judge the living and the dead. The seventh trumpet therefore encompases the second coming, the rapture of the Church, the third woe which is the seven bowls of God's wrath, the battle of Armageddon, the separation of the sheep and the Goats, the end of this age and the beginning of the millennium.